My good fortune had nothing to do with having still-visible collarbones, though. 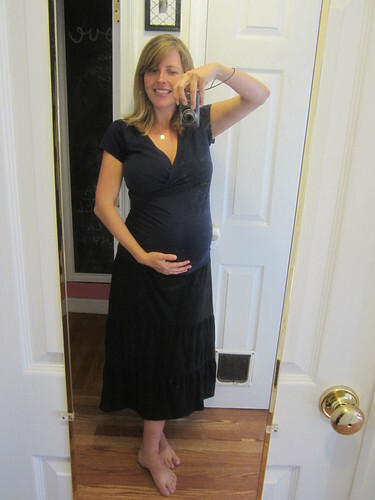 I was lucky because gaining pregnancy weight mainly in the front meant I could hide it for as long as possible at work. According to this article, keeping a pregnancy under wraps at the office is pretty common because plenty of companies will look for just about any excuse to send anyone with a bun in the oven packing. Hiding a pregnancy at work is good old plain common sense. What does surprise me (and maybe you, too) is that it’s also apparently very common for mamas-to-be to keep pregnancies a secret from local mom friends and even family until they’re out of what I call the Danger Zone. The first trimester being the trimester in which big, terrible tragedies are most likely to derail a pregnancy, so the reasoning goes that once you tell a whole lot of people that you’re pregnant, you may find yourself in the uncomfortable position of having to tell those same people that you’re now unpregnant. On the surface, avoiding talking about miscarriage probably seems like a good idea. I get it. Maybe you think you wouldn’t want to talk about a miscarriage any more than things like loneliness in pregnancy and ‘roids. Better to just get over it, move on. Better to wait until the safety of Trimester 2, just in case. I had a miscarriage years ago and the first thing I did was rush out to get a mysterious tattoo in a spot that’s usually not covered by clothing so I had any and every excuse to bring up my miscarriage in polite company. Like when the poor unsuspecting male barista asks about my ink. There was no way I was going to go through the pain and grief of losing a pregnancy again without a support system as vast and as broad as possible from the very beginning. If history repeated itself and I went to one of my ultrasounds only to find out there was no heartbeat to scan, I didn’t want to preface my subsequent grief-infused ramblings with a whole introduction to my baby never-to-be. I didn’t want to have to explain to my mom friends why I needed a shoulder to cry on or a few days worth of hot meals or just to be left alone for a while until I feel ready to rejoin the world. No, in the event that I miscarried again, I wanted my whole world there with me, along for the ride so there’d be someone to drag me back from the edge when I’d inevitably veer too sharply toward the darkness. In honor of October being National Pregnancy and Infant Loss Awareness Month and today (October 15) being International Pregnancy and Infant Loss Awareness Day, I have some advice. If you’re pregnant and hiding it from people reasonably close to you, I’d suggest you reconsider. Pregnancy, whether ultimately joyful or painful, fruitful or not, is a journey best shared. How long did you wait before announcing your pregnancy? I did not want or “need” an own (self given birth – do you say so?) child any more, loving (and being loved by) my stepdaughter, 8 years old. But – it happened. I say, “I did not order the baby, but I never thaught of sending it back”. And the very moment I recognized, being pregnant (I felt it, 20 days after reception – nobody believed me, though -) I told it the very night the father-to-be, and next day I told my gynaecologist, but she wanted me to wait for the proove. I won ;-). And, after that, I had to go by train to tell my mother. Older first-to-be-mothers will remember this “Did you know, my friend Martha is now for the 4th time granny-to-be” or “Did Y tell you, that she is pregnant again” and such. OUUUUUGH. I had this very often, beeing 36 finally! So, I had to tell the news personally, not on the – usually daily – phonecall. After that we (my later husband and I) took the chance at a restaurant with my parents in law to be, my friend and sister in law-to-be plus friends, to tell them the news – it was maybe 6 weeks… and everybody loved the idea. For I was an “old” mother to be, I felt sure, but everybody else was not convinced that everything would be fine. At the end, it was. But I always knew, it could be a problem. I did not believe it. This is MY PERSONAL STORY and I do not want to hurt anyone who made her way through this loss that is to think of or emphasize what it means to loose a child in pregnancy – or later. But I think, what Christa says, share it. The joy, maybe pride, and all the things you imagine… and if, the loss. You will get help, encouragement, empathy and understanding, support… I believe in familylove, in friendshipcare, in solidarity. Anything helps – but not lonelyness and being alone in a depression. Sorry, if I did not find the right words, but – please believe me – I tried.